There are a number of differences between the two approaches, ranging from how they perform channel characterization, to how they consider Tx and Rx noise and apply termination, to the differences between numerical procedures employed to convert given jitter and crosstalk responses into the vertical distribution characterizing eye diagrams and BER. 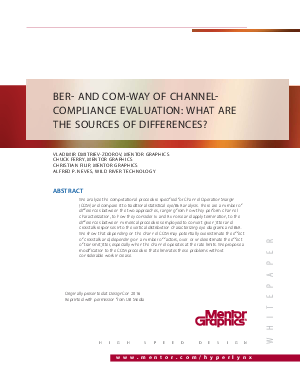 The paper shows that depending on the channel, COM may potentially overestimate the effect of crosstalk and, depending on a number of factors, over or underestimate the effect of transmit jitter, especially when the channel operates at the rate limits. A modification to the COM procedure is proposed that eliminates these problems without considerable work increase.